Take Your Training To The Next Level This Summer! With the winter months behind us, now is a great time to take advantage of the warmer weather by taking your cardio sessions outside. Get ready to take your training up a notch with this summer-time workout. With the winter months behind us, now is a great time to take advantage of the warmer weather by taking your cardio sessions outside. Spring is the perfect time to bring your training up a notch by doing a calorie scorching cardio program without being stuck in the gym. In addition to going outside, the benefits that you will achieve with this training program will help you get into tip top shape for swimsuit season, which is just around the corner!! Christina Lindley and Ginger Redeker. Location, location, location is the key to this particular program. You will want to scope out a fairly steep grassy hill to use in conjunction with this cardio program. A small dam on a reservoir is perfect or any hill that is at least 100 meters in length going up, will suffice. The area needs to be grassy, no gravel or concrete will work, grass is best in order to protect your hands and feet. Yes, I did say hands and feet. Once you have selected the perfect location, now you can move on to the actual cardio program. This program is great to do on your own but it is much more fun when you have a few friends or a group to do it with you. That way, you are more apt to push yourself in the presence of your peers and you can even do the program as a relay race! For all of you trainers out there, this one would be a blast for your clients to do together also!! Warm up by walking or doing some light jogging for 10 minutes. After the warm up, you should stretch thoroughly as this program will ignite muscles you haven't felt in a long time and you don't need to risk injuring yourself by pulling or tearing anything. 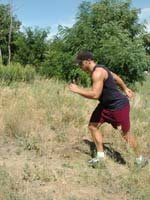 After the warm up, start out by sprinting a distance of 60 meters straight up the hill and then walk back down to the starting position. You will sprint three times up the hill and then take a one minute break. The sprints should be all out, no jogging or half-assing it up the hill, it's a sprint!! The second set of exercises require you to bear crawl up the hill (a bear crawl is where you are on all fours; hands and feet, and you are propelling yourself forward, much like a horse or a bear would, hence the name). Bear crawl up the hill and then walk down to the starting position. Do the bear crawls three times through and then take a one minute break. 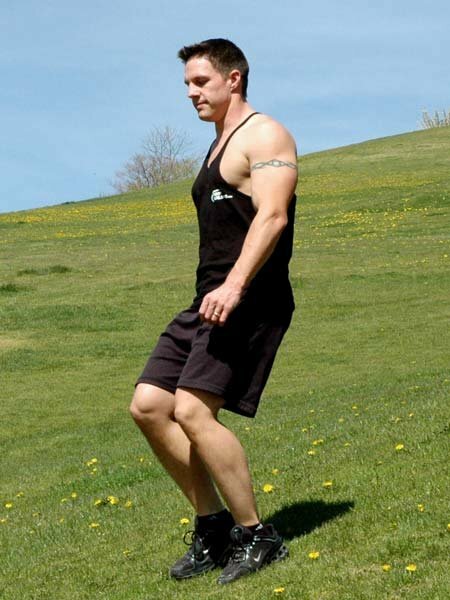 The next sequence requires you to lunge up the hill and walk down. Make sure that when you are lunging that you are stepping out long with the front leg so that your knee never extends over the toe which puts excess strain on your knees. Plus the longer step you take, the fewer lunges you have to make! Lunge it though three times and then follow up with that one minute break. The last exercise is to back peddle or run backwards up the hill. This particular move will target those quadriceps and is a great way to fatigue them. Do this sequence again three times and then go directly into the cool down. For the cool down, walk for 5 to 10 minutes and then make sure that you follow up the cool down with at least 5 minutes of stretching. Here is the breakdown of the cardio program utilizing the hill. Click Here For A Printable Log Of This Cardio Program. This program is tough if you are not already a conditioned athlete. I use the term "athlete" lightly as we are all athletes if we do any type of training inside or outside of the gym. If you feel that this program is too much for you or you are just beginning to workout, start out by doing 1 to 2 sets of each exercise and increase your rest time to two or more minutes after each sequence of exercises. 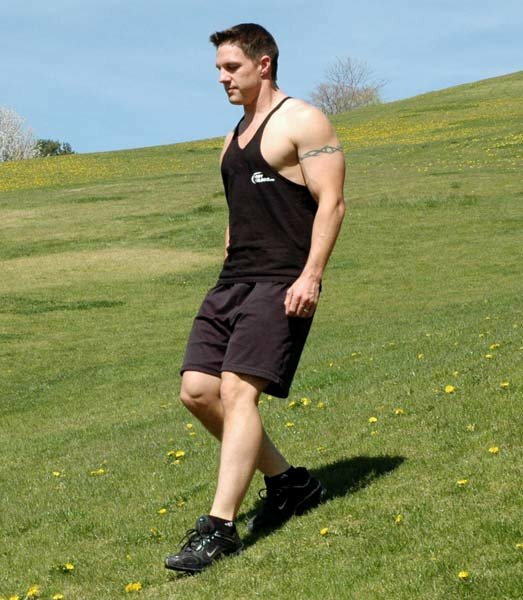 For those crazy, psycho people out there, that loves a challenge and like to suffer (like myself), increase the sets to four and omit the rest in between the exercise sequences and use the walk down the hill as your active rest periods. I can't stress enough the importance of stretching. 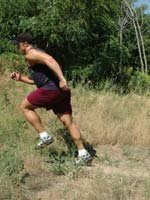 Please do not neglect this critical component of the program because your body is not use to operating up an incline such as a hill. 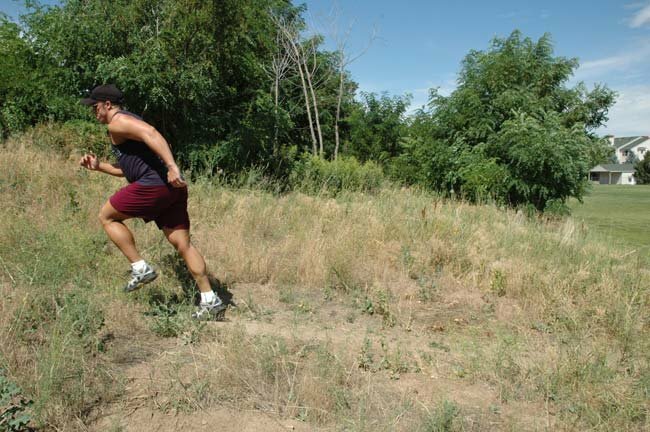 Utilizing the hill will stress the body in a whole new way so expect to be sore. This program is intense but fun and incorporating it into your training program several times a week will provide great results. Use this cardio program to take your training up a notch and torch tons of calories to help you to get into tip top shape for summer!